Naomi: How did you come to work for your current position? JP: I started working in libraries with my first paid position in 1996 when I was 14 in a Children’s library. I kept working there throughout high school, and then college, because it was a job. I decided to BECOME a librarian because 1) I liked libraries and 2) because Melissa Kopecky told me to. At 21, I was still working the same job I had at 14. By 23, I was in Rutgers Library School as one of the NJ State Library’s 21 Century Urban Librarian grant recipients. I went through their school library program, which was the top ranked school library program in the country, and did my internship in a local urban high school. I also STILL worked at the same library I worked at since I was 14, worked part-time as a vanilla public reference librarian, and then left that part-time position to work as the “IT guy” for an academic library. Finally I started at this library in 2009. I spent 1996-2009 at my original library, grew up there basically. Those were fun times. I haven’t really decided, yet, if I’m a public, school, or academic librarian, but I like my current academic library a lot. Naomi: Can you speak a little bit about the program you won the Library Journal Movers & Shakers award for? JP: I got Movers and Shakers because I love libraries. Lots of people love libraries, but I REALLY love libraries. Most people get profiled because of the work they do, and that’s cool, but I got it because I’m probably the biggest fan of libraries out there. Not saying I don’t do good work, but I do good work PLUS I am REALLY EXCITED about it. JP: My favorite book is Alice’s Adventures in Wonderland. I read it at least once a year when I worked in the children’s library. In my current library we have a small rare books collection, and one of them is a copy of that book, illustrated by Salvador Dali. So amazing. It is signed by him and everything. I’d say my almost equally favorite book is The Medium is the Massage by Marshall McLuhan. It includes a few plates from original Alice illustrations. It is almost as surreal as it is academic. It has really influenced my professional thinking. JP: My favorite thing about libraries is the building! :)! Without a well-staffed library building, we have nothing. JP: Nicole Pagaowsky’s Librarian Wardrobe. They have a very specific mission, to be an internet catalog of what librarians wear at work. I am lucky to be able to say I share a veryyyyy small part of the work of LW: I own the domain librarianwardrobe.com. It will be one of my 7 library horcruxes when I turn evil. 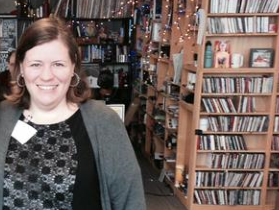 Kate Tkacik is the librarian with the largest social media reach of anyone out there. Her tumblr, thelifeguardlibrarian.tumblr.com, has over 21 THOUSAND followers. There is NO librarian on twitter, facebook, instagram, etc, who even comes close to a social media reach that far, and for good reason, she’s one of the most engaging librarians on the internet. I’m also a big fan of Amanda Brennan, who is the librarian for knowyourmeme.com. Her tumblr is memelibrarian.com. Amanda introduced me to Dana Ash, who I think is my sidekick at this point. We’re all Jersey library buddies. Everything I linked to is a tumblr, so my summary of who to follow are the Tumblarians. By and large they are the youngest of degree’d librarians, with a TON of them still going through library school, so they are DEFINITLY who to look to if you want to know what libraries are going to be like in the future. Naomi: Any tips for job hunters? JP: Go through this very difficult time with friends. We are all trying to answer that question: HOW do we get a library job?! The answer to that is “together”. Build up a solid network of friends. Use each other as therapists. Talk to each other about everything. Become friends, invite each other to parties and to dinner and crash at each other’s houses. There are resources on HOW to dress, WHAT to say, WHERE to look for a job, but I don’t see ANYONE saying “do it as a team”. I guess I’m a big fan of teams (which is how #ALATT happened). Also, seek out internships. In 2011 and 2012 (and hopefully starting again soon) I would run these almost-weekly “bar nights” at the bar closest to the library school. Besides all the really strong relationships that grew out of it, some formal things grew out of it too, including this NJLA Internship program. That is the kind of thing to look for (or start yourself, if you don’t see it). JP Porcaro is Acquisitions and Technological Discovery Librarian at New Jersey City University. 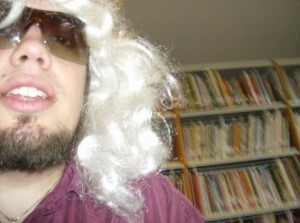 He’s part of the teams that founded 8bitlibrary.com, ALA Think Tank, and GameRT. He currently serves as NJ’s chapter councilor to the ALA Council, on the NJLA Executive Board, and as a Senior Advisor to the EveryLibrary Political Action Committee. He was part of the ALA Emerging Leaders class of 2010, a 2012 Library Journal Mover and Shaker, and has championed the inspirational hashtags #makeithappen & #partyhard. ← 4 Million page views!